Those aren’t words you hear very often in suburbia, but if you’re hanging out in Tysons Corner, Virginia, you’d better get used to it. This office enclave, which sits dead center between Washington, DC and Dulles International Airport, is experiencing a rare and dramatic transformation – from traffic-choked “edge city” to walkable urban center. Fifty years ago this area was dairy farms. But fueled by employment at the headquarters of several major defense contractors, Tysons is now the 12th biggest business district in the country, and the single biggest outside a major city. Even during the recession, office vacancy has stayed comparatively low at 14 percent. Tysons is also a retail heavyweight, with the fifth biggest shopping mall in the U.S. And no wonder – it sits in Fairfax County, consistently ranked one of the wealthiest in the country. But even with all these jobs and shopping opportunities, it lacks people. There are 105,000 jobs in Tysons but only 17,000 residents. Nobody lives there. All of this presents a unique opportunity for planners. How do you take an existing business district — dysfunctional but also thriving in its own way — and re-fashion it into a real urban center? And how do you get community support for a project that’s going to mean decades of disruptive construction and the uprooting of much existing infrastructure? And making a walker’s nightmare into a walker’s paradise will be difficult. They’re building new city streets to fill in a semblance of a grid where now there are only wide arterial roads with long stretches between intersections. To do that, planners need to negotiate with business owners for their property, and their leases all expire at different times. 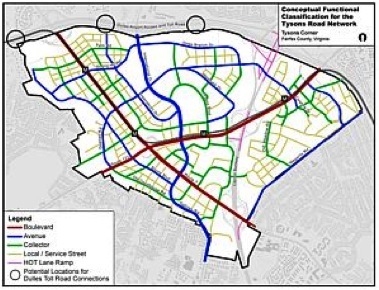 And since Tysons is an unincorporated part of the county, and the county doesn’t control its own streets, this all requires a lot of negotiation with VDOT as well. Developers are enthusiastic partners in this enterprise. Promised unlimited density within a quarter-mile radius around new metro stations (and there are four new stations planned for a four-mile strip), they are champing at the bit to tax themselves. They’ve agreed to a $480 million tax assessment district (22 cents per $100 of assessed property value) for the first phase and up to $300 million (10 cents per $100) for the second phase of building. Developers are also willing to build roads – and even schools and fire stations – on their properties, to serve the 30-odd story towers they’re planning to build. A major impetus for all this change is the Metro extension to Dulles Airport. The new silver line will have 11 stations along a 23-mile rail extension. It represents a 25 percent increase over Metro’s current capacity, according to Marcia McAllister of the Metropolitan Washington Airports Authority. She spoke to a group from the Rail~Volution conference last week. The rail extension has attracted a lot of attention for its cost overruns and a prolonged debate over whether to build above ground or below ground. There are disagreements over whether to mandate the use of union labor. And financing is still in question: While tolling on the Dulles Toll Road is expected to meet 57 percent of the funding goals for Phase One (the first five stations, including all four in Tysons), some officials balk at the idea of letting tolls finance Phase Two (the last six stations, including the airport) as well. And while the federal government is ponying up about 15 percent of the cost of Phase One, so far it hasn’t offered a dime for Phase Two. 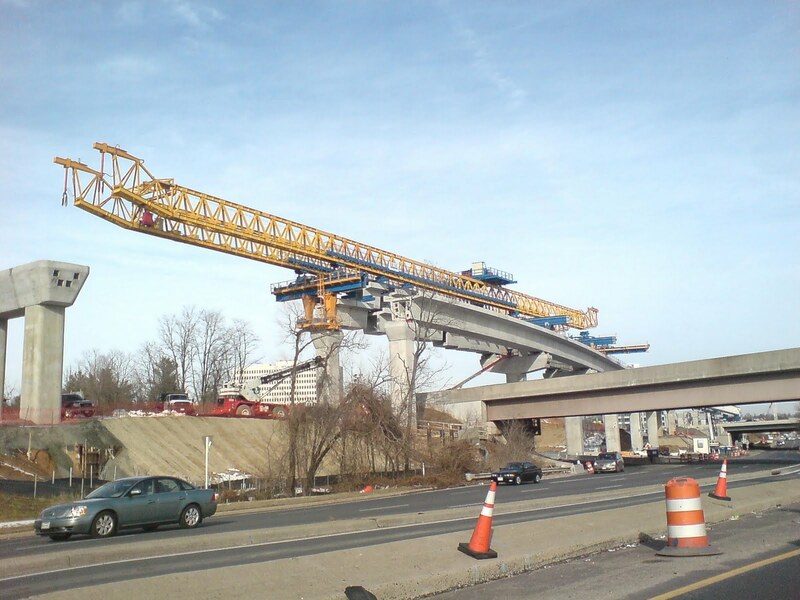 McAllister and the MWAA say the first phase will be operational by mid-2013, but delays have made some suspicious that that timeline is unrealistic. Metrorail construction in Tysons Corner. Still, the changes in Tysons are already visible. Anywhere you stand, you can see Metro construction. None of the four Tysons stations will have any commuter parking whatsoever. (All of the Phase Two stations will have parking garages except for the one at the airport.) Indeed, the new Tysons will have parking maximums that are lower than the original parking minimums. And the car dealerships dotting the landscape will go the way of the dinosaurs, planners say: When the value of real estate skyrockets, their large surface parking lots will become impractical. Of course, they’re building a Walmart where there used to be a car dealership. Nobody said this is the kind of urbanism that you’d find in, you know, a city. The Washington Post recently profiled an imagined 2014 Tysons and noted that there are still Exxon stations and McDonalds restaurants surrounded by parking, and the Post isn’t so optimistic that the auto dealerships will disappear entirely. They envision quarter-mile “blocks” still lined with them. The new development won’t have the historic rowhouses with front porches or the charming old apartment buildings you find in Washington, but its new walkability, transit access, and mixed-use vitality could be enough to draw people looking for an urban-ish experience away from the grit of DC. Fairfax planner Matt Ladd said he doesn’t think new Tysons residents will come primarily from DC, because it’s a “different market,” but to explain that, he went on to say that Fairfax has far better public schools (some of the best in the country, as opposed to some of the worst in DC). And office rents are lower. Residential rents will likely be “comparable,” he says – but that’s comparing brand-new units with smaller, older apartments in the city. No one intentionally sets out live in a place with high rents and crappy schools, so let’s assume, yes, Tysons could well be a draw for many city dwellers. And given that there are such significant employment centers in Tysons and the surrounding area, along the Dulles Toll Road and Routes 66 and 270, taking up residence in Tysons could mean a shorter commute for many people. The guarantee that developers will build 20 percent of residential units as “workforce” units, priced below market value, will make the area even more attractive. That’s all part of the plan. The ultimate goal is to increase employment in Tysons by nearly 100 percent, to 200,000 jobs, and to increase residential nearly sixfold, to 100,000 residents. What happens, though, if the wars in the Middle East finally end and Congress accepts significant cuts to the defense budget, and the defense contracting sector shrinks? With such a major source of employment diminished, could the plans for Tysons’ revitalization survive? Or is it all a by-product of what has been called Washington’s “Doom Boom,” the vibrant jobs market surrounding an increased federal dedication to war and homeland security? No sweat, the developers and planners say: Tysons has done a good job diversifying its employer base. Not only are Mitre, Booz Allen Hamilton, SAIC and other defense contractors located there, but Tysons is also home to Capital One, PNC Bank, Hilton Worldwide, Freddie Mac, Sprint Nextel and USA Today/Gannett Publications. Whether Phase One is finished on time in 2013 or a bit later, it will transform an emblem of sprawl into a signal to the rest of the country that you don’t need a greenfield to make a new, livable community a reality. They need a form-based code to create a consistent urban fabric. Then they could produce some genuinely good urban design, rather than the mish-mash that they have in their visualization. Ever since Seaside, the New Urbanists have created well designed towns using form-based codes. This is an opportunity to do it for what is essentially an entire city that is being built from scratch. With a form-based code, we could get something like a traditional European city. 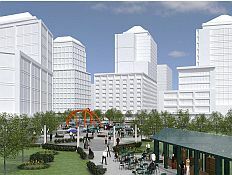 By contrast, their visualization looks like a mid-twentieth century American downtown. As a matter of fact, the conceptual plan does include some ideas similar to form-based codes. If you look at the graphic on this page (http://www.fairfaxcounty.gov/tysons/comprehensiveplan/urbandesign.htm) it shows that building heights will be determined/influenced by their proximity to the Metro stations, sort of an urban transect. That link doesn’t work. The fact that heights depend on proximity to transit does not mean it is a form-based code. You can have height limits, and vary them as you choose, with either form-based codes or conventional zoning. Certainly Tysons is NOT walkable now–it doesn’t even have walks in key places–but it remains to be seen whether it will be walkable or–more importantly–actually walked 20, 30, 40 years from now. While the planned 2:1 jobs:residents ratio is certainly an improvement over the present situation (~6:1), most studies and actual experience (including Rosslyn-Ballston) indicate traffic is reduced when these populations are balanced or even tilted toward residential. From this student’s perspective the first two of these characteristics is driven by the urban form. The plan for Tysons, regrettably, is not highly residential intensive and, indeed, as your graphic shows, has large block sizes. In fact, while Tysons may become more walkable, its recent 529 report to VDOT calls for both added lanes and added ramps along the Dulles Toll Road to accommodate the additional traffic it anticipates. I don’t think this will end well for those would like to be able to walk or bike more. A few auto dealers might survive, just not in their present form with acres of surface parking. There are multiple car dealers in downtown Bethesda, but they have much smaller footprints with structured parking. I think that’s a bit off-base. 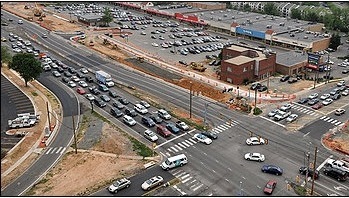 Tyson’s Corner (like all other urbanization projects in the area) will help absorb new growth that we know is coming. If people wanted lower rents and better schools in an urbanized area, there are already many (and growing) options in Arlington and Montgomery Counties. It’s more likely that if people move out of an established urban area seeking more space and better schools, they will be drawn more to a suburbs, not to a newly urbanized Tyson’s.